The Philby's Partridge (Alectoris philbyi) is related to the chukar, red-legged partridge and barbary partridges and is native to Southwestern Arabia and northern Yemen. 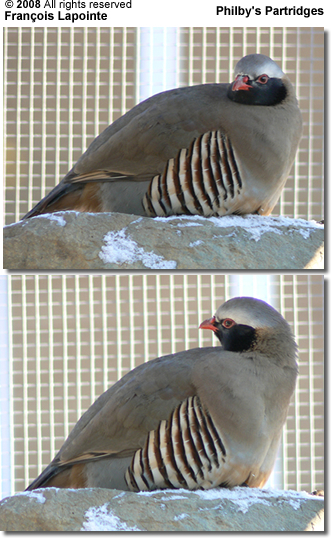 This species is sometimes considered to be a race of the Rock Partridge (Alectoris graeca). Its name commemorates the British explorer St. John Philby. Although similar in appearance to other Alectoris species, Philby's Partridge can easily be distinguished by the black cheeks and throat; a narrow white stripe from the bill to behind the eye separates the black from the grayish-blue head; rest of plumage is similar to that of the Chukar Partridge. Both sexes look alike; but males may be slightly larger and will have a tarsal knob (spur), which is more pronounced in older birds. A silver mutation has been developed in captivity. This species was imported into the United States in the 1980s and are now well established and common in aviculture. These partridges reach breeding age when they are about one year old. The breeding season in the United States commences in April and continues until about June. The average clutch consists of 5 to 8 buff-colored eggs with link pink flecks. The incubation period is about 25 days. This species is similar in habits to captive Chukars. Once properly acclimatized, they are hardy during the colder months. Chicks can be raised in the same fashion as Chukars.